AFA stands for Amino acid Filaggrin based Antioxidants: a formula that is based on the same type of amino acids found in your body that work naturally to boost the retention of moisture in your skin. The AFA Clay Peel facial uses this unique formula, loaded with antioxidants that help to exfoliate your skin and retain moisture while causing virtually no irritation. 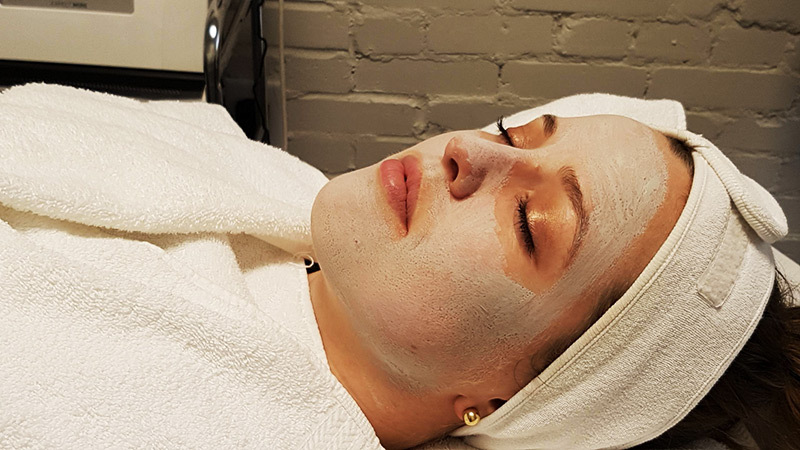 It is a two-step process (clay mask and refreshing peel) that is designed to address aging skin, pigmentation (from sun damage), and enlarged pores. How Does the AFA Clay Peel Facial Work? The AFA Clay Mask is applied and remains on for five minutes to draw out impurities and absorb excess oil from your face. It is then removed with water. Next, the AFA Peel is evenly applied, where it will work to exfoliate dead skin cells and remove any impurities, with much less irritation than you would experience from any other chemical peel. Immediately following the AFA Clay Peel, you will notice dramatic results, skin that is smoother, softer and tighter. Q: How long does an AFA Clay Peel facial take? A: In total, you can expect an AFA Clay Peel facial treatment to take 45 minutes to complete. Q: Is there any downtime from an AFA Clay Peel treatment? A: You may experience some redness in the face for a few hours following your treatment. Q: Is there a recommended course of treatments? A: At Midtown Med Spa, we suggest a series of four to six AFA Clay Peel treatments for optimal results.